It’s estimated that more than 3 million people marched in hundreds of U.S. cities for women’s rights on inauguration weekend. One of their concerns was preserving access to affordable and appropriate health care. Unfortunately, this access is threatened by recent actions taken by the Republican majority in Congress to begin the repeal of the Affordable Care Act (ACA). If the ACA is dismantled, this would leave millions of Americans without health insurance coverage. According to a recent report by the Urban Institute, nearly 7.5 million women between the ages of 19 and 64 gained health care coverage due to the implementation of the ACA. 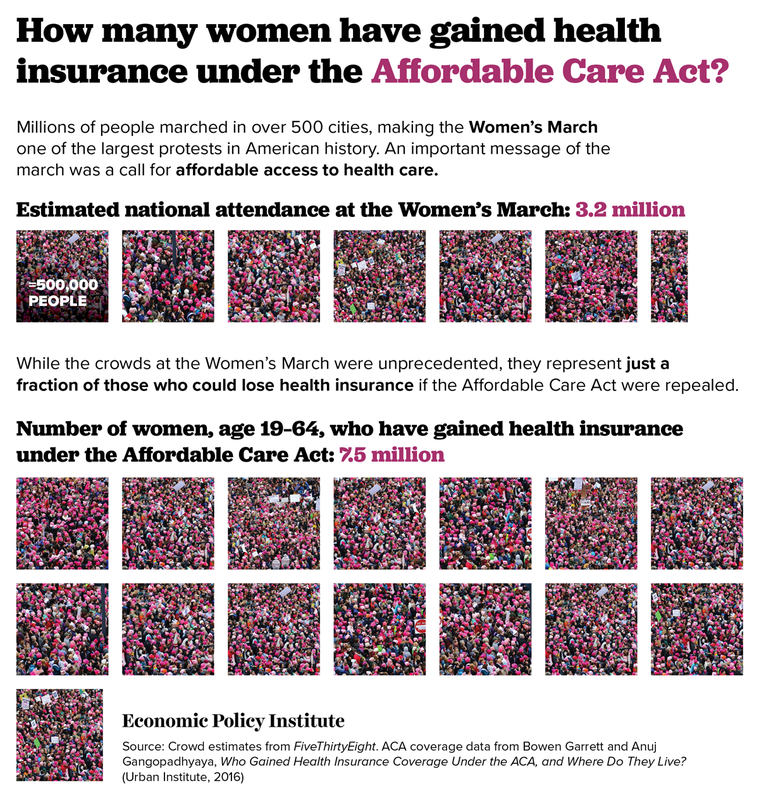 The number of uninsured women in this age range dropped nearly 40 percent between 2010 and 2015. While women saw a larger percentage drop in uninsured rates due to the ACA, the drop for men was even larger in absolute terms, with 8.9 million men gaining coverage between 2010 and 2015. Finally, besides these adult coverage gains, 2.8 million children also gained coverage in those years due to the ACA. The Congressional Budget Office estimates that, by 2026, 32 million Americans will ultimately become uninsured by the repeal of the ACA. All in all, the ACA clearly made significant progress in what was its major stated goal: expanding health insurance coverage for men, women, and children.